It’s not clear that the plans will work as expected in terms of the announced timeline of completing 16 reactors (17.6 Gwe) by 2032. The cost of the program is close to $90 billion which over a period of more than two decades for a feasible schedule would involve a significant diversion of oil revenue even at $100/BBL. The current price is about $60/bbl and has been in that range since January 2015. Key issues for success are adequate sustained financing, supply chain logistics and reliability, as well as cost control, for three separate sites, and managing the fleet of reactors once they are built. The demand for long lead time components for a new build of this size would raise the prices for them on a global scale. The Reuters wire service reports that Saudi Arabia plans in April or May 2018 to release a short list of qualified bidders for two nuclear reactors and to make the contact award by December. It plans to build 17.6 gigawatts (GW) (16 1100 MW reactors or a mix of various sizes) of nuclear capacity by 2032. 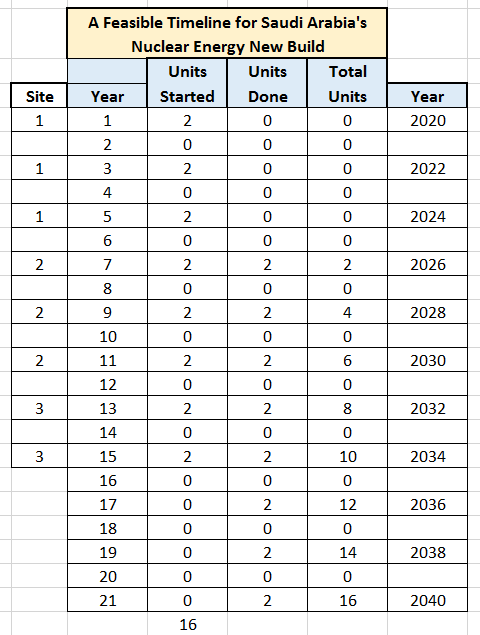 The date is wildly ambitious and even a simple exercise in looking at the schedule of building 16 reactors of this size shows a minimum 20-to-25 year time frame. If the first two units breaks ground in 2020, the last one will be finished in the early 2040s. (See table below). The analysis that follows is an intended to show, using a simple linear model, why the plans appear to be overly ambitious. Saudi Arabia’s energy minister, Khalid al-Falih, told Reuters last month that he expects to sign contracts to build two nuclear reactors by the end of 2018. Commissioning of the first plant, which will have two reactors with a total a capacity between 2.0 and 3.2 GW, is expected in 2027. These numbers suggest that the specifications in the RFI have changed from an initial requirement for two 1400 MW units, which is the size the ones being built by South Korea in the UAE, to a more flexible requirement to either open the bidding to wider competition or to put pricing pressure on a South Korean deal. Saudi Arabia has sent a request for information (RFI) to international suppliers to build two reactors. An RFI is the first step in the procurement process. Once there are expressions of interest, the Saudi government will pre-qualify firms or countries to submit actual bids. Based on experiences with other countries, the Saudi government should count itself lucky if it even gets bids by December. It will take a minimum of another six months to make an award putting the contract date well into 2019. According to wire service reports the Saudi government is evaluating requirements from five countries; China, Russia, South Korea, France and the United States. Russian and South Korean companies have said they plan to bid and sources have told Reuters that Toshiba-owned U.S. company Westinghouse is in talks with U.S. rivals to form a bidding consortium. French state-controlled utility EDF also intends to take part in the tender. “Currently we are in the evaluation process for RFI (request for information) and we will hold discussions with them (suppliers) next month,” Abdul Malik al-Sabery, a consultant at the King Abdullah City for Atomic and Renewable Energy told Reuters in Abu Dhabi. He added that financing would be provided in part by the winning vendor. From the time the units break ground until the time they are commissioned for revenue service could take six-to-seven years with a cost of $5-6 billion each. Bear in mind the Saudi government has selected three coastal sites for the 16 reactors which means site mobilization will also be a factor. There is no guarantee costs would remain in the range of $5,000/kw for the reactors. Given the scale of the project, cost escalation is probably inevitable. 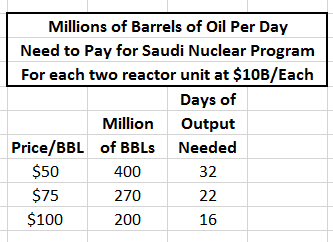 The Saudi plan gives up certain economies of scale by mixing reactor vendors, sizes, and locations. Three sites were short-listed as of September 2013: Jubail on the Gulf; and Tabuk and Jizan on the Red Sea. While the Saudi government has claimed it would be able to finish all 16 reactors by 2032, as a practical matter they will only be able to complete eight units by that time. It will take until the early 2040s to commission all 16 units at three sites. The table below shows that if the first two reactors at the first site break ground by 2020, they will enter revenue service by 2027. There are practical limits to financing, supply chain capacity, and available workforce that will force the Saudi project to start each two unit module at least two years apart. Also, to achieve maximum economies of scale, the project managers would not start units at all three sites at the same time. Financing is a crucial element. The ability of the Saudi oil infrastructure to produce oil is estimated to be about 12.5 million barrels a day. The price of a barrel of oil has been in the doldrums at less that $60/bbl since January 2015. Oil analysts point out that market conditions in the future might reduce that level of output to maintain price. The assumption here is that Saudi Arabia will lean out the construction schedule to start two units every two years. First, this move will lessen demands on the supply chain and available manpower. Second, it will reduce the amount of revenue from oil sales that will have to be diverted to reactor construction. The main driver for the Saudi plans to build reactors, which were initially announced in 2011, is that at the rate that it is burning its own oil, it may have substantially less to export in just a decade or so. At a minimum, it may lose the excess capacity the rest of the world relies on when there are disruptions in supplies from other countries. One scenario suggested by energy analysts that follow oil markets is that within two decades most of the Saudi output would be used for domestic consumption. Electricity demand is predicted to increase from 75 GWe by 2018 to more than 120 Gwe by 2030. This growth can’t be sustained by fossil fuel alone and also maintain the income stream the nation depends on from oil exports. Nuclear reactors are an obvious choice to intervene in an unsustainable growth scenario. The 16 reactors KSA plans to build will be part of a strategy of being a regional exporter of electricity. When complete they would provide as much as one-third of all the electricity used in the country. For more information see the World Nuclear Association’s profile of nuclear energy in Saudi Arabia last updated in October 2017. Yes, the Saudi have a sovereign wealth fund, and they are planning an IPO for Aramco said to be worth $100B, but it is unlikely they want to tap either source of capital for a nuclear reactor program. Here’s why. In September 2014 the price of oil held at around $100 bbl which is when they announced the revamped nuclear reactor program for 16 units. In January 2015 all bets were off and the nuclear program was postponed to the distant 2040s. The reason was that the price of oil dropped like a rock at the end of 2014 to under $60/bbl where is stayed until very recently. This sequence of events shows that the intention has always been to fund the reactor program out of current and future oil revenues and not from financial reserves. When the price of oil dropped by $40/bbl they hit the brakes. Currently, the Saudi have an RFI on the street for just two reactors and there is considerable speculation that they may be just fishing for an idea of what the reactors will really cost, but have no clear plan for issuing an RFP nor actually signing a contract to build them. Note also that the Saudi have MOUs with South Korea and China for LWR and HTGR type SMRs, respectively, in the range of less than 300 MW per unit. If they just want to get their toes in the water and keep their knees dry, at an overnight price of $5K/Kw, a 300 MW LWR would cost just $1.5B which is a lot easier to fund than a 1000 MW unit at $5B or 2 of them for $10B. Overall, it is a given that the Saudi are very price sensitive when it comes to reactor technology, based on their responses to sharp drops in oil prices, and will proceed very slowly. The decision in January 2015 shows the Finance Ministry is in charge and not the technologists. 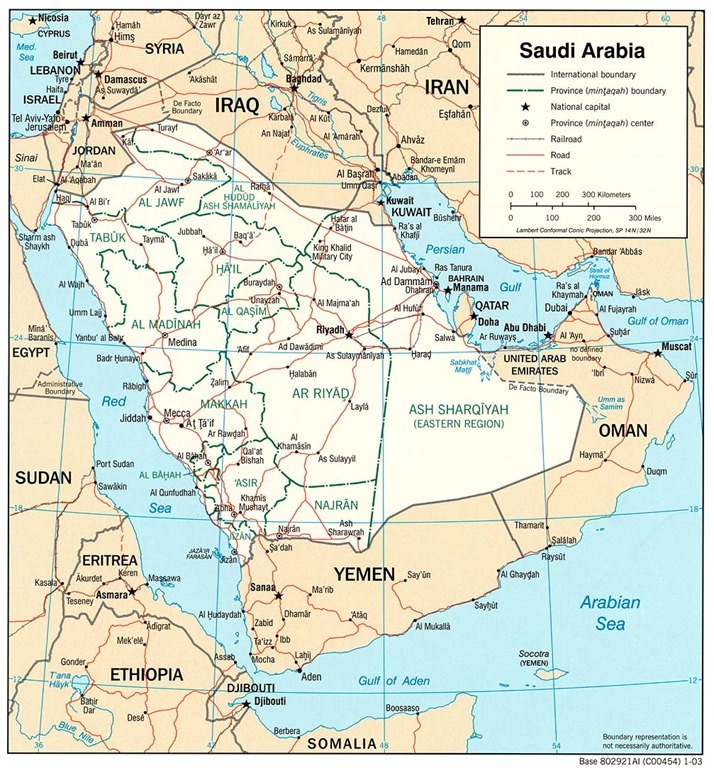 American firms like Westinghouse and Curtis-Wright will not be able to participate in the project unless Saudi Arabia signs a 1-2-3 Agreement with the U.S. That prospect looks problematic at best due to statements from Saudi officials that they do not want to give up the right to uranium enrichment as a strategic hedge against Iran. The Obama administration sought but did not complete a 1-2-3 agreement with Saudi Arabia along the lines of the one it signed with the UAE, which committed to reliable fuel services rather than developing its own enrichment capabilities. The UAE has been touted as a model for other nations as a so-called “gold standard” as it has a a $20-billion contract with South Korea to build four nuclear reactors. The first of the four units will come online in 2018. According to Mark Hibbs, a nuclear energy analyst with the Carnegie Endowment for International Peace, the lack of a 1-2-3 agreement with the United States could impact Saudi Arabia’s ability to import nuclear technologies from other nations. The South Korean APR1400 contains extensive US/Westinghouse content. The UAE needed a 123 Agreement to buy the Barakah reactors from South Korea. KSA will need a 123 Agreement with US in order to consider buying APR1400 reactors from South Korea. France and Japan would not transfer enrichment and reprocessing technologies to Saudi Arabia. Both of these countries, along with the United States and the other members of the G8, pledged indefinitely not to export these items to newcomer countries. Saudi Arabia could get these technologies from Pakistan. The Reuters wire service reports that Brazil’s government is struggling to attract investors to restart construction on its Angra 3 nuclear plant, where work has been halted since 2015. The State controlled electric utility Centrias Electras Brqasileiras SA told the wire service it had held exploratory discussions with Russia and China but that no agreement had been reached with them nor EDF nor any other potential investor. So far spending on the project has totaled about $5 billion with an anticipated additional spending needed of about $4 billion. The project is said to be two-thirds complete. The utility hopes to raise the needed funds by 2019 and complete the reactor by 2025. Brazil has plans for additional nuclear reactors, but given its inability to fund the current project to completion, investors who would want guarantees of future work, like China National Nuclear Corp., are reported to be wary of making commitments. Once complete the price of electricity from the plant will be set at close to $0.13/KwH to cover the costs. Budget woes were not the only reason work stopped on the project. A major bribery and money laundering scandal involving construction firms working on the site claimed the careers of several high level government officials. In August 2015 Federal police in Brazil have arrested Othon Luiz Pinheiro da Silva, CEO of Elecrtrobas Termonuclear, which is building the country’s third nuclear reactor, Angra 3, on charges he took bribes from construction firms involved in the project. The investigation into the bribes got its start in an unrelated investigation into a money laundering scheme. Standard & Poors said at the time the arrest of the nuclear chief was another “political uncertainty” that caused the rating agency to change Brazil’s credit outlook to negative. U.S. investors have sued Electrobas for failing to disclose the arrest of the company’s CEO. Bond yields for the firm, reflecting the higher risks associated with the company’s CEO being caught up in a bribery case, rose to 8%. Elecrobas has denied any wrong doing and put the CEO on a leave of absence.